Any of the eight I/O ports CAN be configured as input or output. An active-low reset input sets the eight I/Os as inputs. Three address-select pins configure one of 56 slave ID addresses. The MAX7310 is available in 16-pin thin QFN, TSSOP, and QSOP packages and is specified over the -40C to +125C automotive temperature range. This is one package pinout of MAX7310,If you need more pinouts please download MAX7310's pdf datasheet. 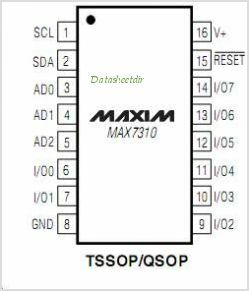 MAX7310 circuits will be updated soon..., now you can download the pdf datasheet to check the circuits!